Up until about 10-15 years ago we knew what caused ill-health among poor people, namely: not enough money. After all money buys better housing, better nutrition and the education to choose a healthier lifestyle. If only it was that simple. 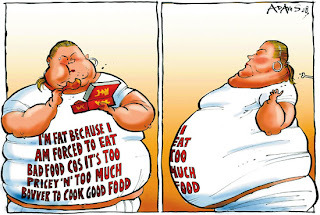 For the first time in human history being fat is a sign of poverty, not wealth. As numerous studies of the problem of obesity have pointed out, it is choices that people make (about their values and behaviours) that is now the main source of ill-health rather than the choices they can't make. This is less true of older generations, of course, many of whom did indeed grow up with 'the stain on the wall' and who are now suffering the consequences of genuine poverty in the form of chronic ill-health. The health arena may well be the final battle-ground between those who believe that 'tax and spend' is the solution and those who believe that 'freedom and choice' will deliver more efficiently and effectively. And yes, I'm in the latter camp - who couldn't be after seeing the 'benefits' of a 64% increase in real healthcare spending per capita in Ireland between 1999 and 2005. And some people think the solution is 'more' ...? The health debate goes to the heart of the key issue of inequality. We're going to hear a lot more about inequality now that the economic cake isn't getting bigger. It's already becoming a major issue in the US Presidential election, with some angry at the huge increases in inequality experienced in recent decades, and those who see inequality as a consequence of rapid economic change and growth - but not an objective (nor necessarily a permanent feature). One other factor in the politics of inequality in Ireland will be the impact of immigration. It seems immigrants bring their cultural values about inequality with them (pdf) to their host countries (like the Irish did after the Famine). So if all those Eastern Europeans imbued by the socialist leanings of their predecessors vote with their parents' values I suspect that Labour will be in government next time round. Finally (having barely skimmed the surface of the matter) I have one piece of advice for the poverty industry with regard to ending poverty and ill-health: call for the National Lottery to be banned. Do that and I might even support some of your other ideas. As I understand it the health system needs a complete overhaul and put on a footing whereby it can be run efficiently. What's stopping this? Well, systematic incompetance (the monkey experiment) and unions meaning you can't simply rip it up and start again. It is inefficient because it does not have the "survival of the fittest" model that inherantly promotes the tallented and efficient within the friedmanite model. This model, however, does view things in an abstract fashion and therefore suffers from the stalinist view of "one death is a tragedy, a million deaths is a statistic". I refuse to believe that a system that is inherantly lacking in compassion is truly the way forward. Lets face it, survival of the fittest puts predators at the top of the food chain. "knowledge without compassion can never be wisdom"